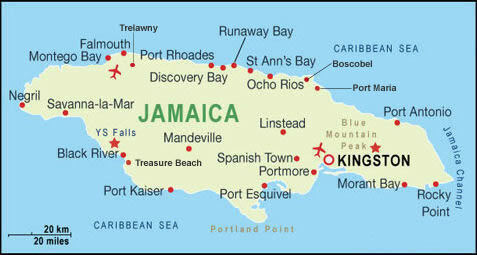 Runaway Bay is located on the north coast of Jamaica, 40 miles east of Montego Bay Sangster International Airport. Runaway Bay is small, quiet and laid back beach resorts. Runaway Bay holidays are based along a four-mile stretch of fine sandy beaches and coves. The hill that forms the back drop of this resort is covered by lush tropical rain forest. Runaway Bay, the site where Columbus first landed in Jamaica, lies between the two resorts of Montego Bay and Ocho Rios. Runaway Bay is quieter and more relaxed than the neighboring resorts and caters well for families and couples of all ages. Runaway Bay's hotels are located by the beach or above, in the gently sloping hills that lie behind the coastal road. A Holiday in Runaway Bay will appeal to those looking for a relatively simple relaxing Jamaica holiday. A low-key selection of bars, restaurants and shops coupled with excellent hotels are exactly what the doctor ordered. All inclusive holidays and luxury holidays to Runaway Bay will appeal to those who want to get away from it all. Holidays in Runaway Bay are often offered on an all inclusive basis, with a mix of family orientated hotels and popular adult-only options. Most dining and nightlife is found in Runaway Bay hotels but it's worth trying the local seafood. Golf fans on holiday in Runaway Bay will enjoy an 18-hole course. You can enjoy a wide range of water sports such as scuba diving, deep sea fishing, jet skiing, para sailing, snorkeling. Land lovers are also well catered for with activities include tennis, climbing the famous Dunns River Falls, horse back riding, white water rafting, quad biking, swimming with dolphins at Dolphin Cove, Green Grotto Caves, jeep safaris, helicopter tours, The Bob Marley Mausoleum and many more. Holidays in Runaway Bay are ideally placed for visiting most of the interesting spots on the north coast of Jamaica from Falmouth to Ocho Rios. Popular Runaway Bay holiday excursions include plantations and colonial houses, the Green Grotto caves, Dunn's River Falls, Dolphin Cove and The Bob Marley Mausoleum. The nearby town of Ocho Rios is also one of Jamaica's best spots for duty free shopping, souvenirs and jewelry. Most of the popular shopping centers are located in the center of town and all within walking distant of each other. Check out the popular Ocho Rios Craft Market, Old Craft Market, Ocean Village Shopping Center, Taj Mahal shopping center.